More than 50 CR10-based monitoring systems were used for structural monitoring during the construction of London's Heathrow Express Rail Link. 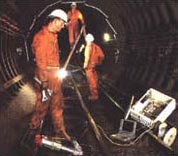 Similar systems are being used for the extension of the Underground's Jubilee Line. Reliable and accurate structural monitoring is especially critical since 12 km of the tunnel runs close to historical sites such as Big Ben, Westminster Bridge, and Canary Wharf. The systems monitor a range of sensors including electrolevels, borehole rod extensiometers, vibrating wire (VW) crackmeters, VW piezometers, and VW strain gauges.